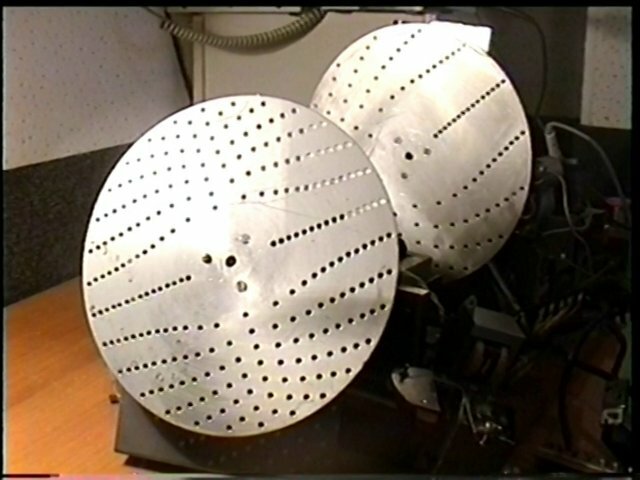 The first image of Rhythmicon Discs is from a video called ” The Rhythmicon revival after 45 years of silence ” by Andrey Smirnov, who documented his fixing the 3rd version of the original at The Theremin Center, Moscow, in December 2004. — background: 15 layers progressing in steps of 1 (harmonics 1, 2, 3, …, 15). Second set (black disc diagrams) consists of a pitch wheel (left) and tempo wheel (right) which, according to the picture’s source, belonged to the 2nd Rhythmicon built by Lev. — right: 16 layers progressing in steps of 1 (harmonics 1, 2, 3, …, 16). The choice for having a standard 7-white/5-black piano keyboard as controller is unfortunate, since this irregular layout fails to properly represent the natural harmonic relationships between the rhythmical patterns. btw; your website: http://whatmusicreallyis.com/ is fantastic! Thank you, Simon, for this excellent timeline ! The above comment may produce some misunderstanding. On both images, the disks on the right are responsible for rhythm, and the disks on the left are responsible for pitch. Rhythm disks are almost similar, the only difference – amount of rhythms – 15 and 16. And in the case of these disks it would be better to talk not about harmonics, but rhythms: basic rhythm, rhythm on 2, on 3, on 4, on 5 etc. Regarding the pitch disks – all pitched sounds related to harmonics are produced by their means and no other harmonics are available. It means that pitch disk on the first image produces the set of pitches related to the 1st, 2nd, 3rd ,4th etc. up to 15th harmonics by means of layers with 2 holes, 4 holes, 6 holes etc. The pitch disk on the second image produces the set of pitches, related to the 1st, 2nd, 3rd etc. up to 16th harmonics by means of layers with 6 holes, 12 holes, 18 holes etc. Amount of holes depends only on the range of rotating speeds and required pitch ranges. Slower motor – more holes for the 1st harmonic are required. И ещё: на фото вверху (с ритмиконом) никакой не Генри Коуэлл, а Иосиф Шиллингер. This part of the text: “The eventual machine was christened the “Rythmicon”…. etc. is completely wrong. The rhythmicon is not an electronic, but electro-optical rhythm machine, it has nothing in common with the theremin and doesn’t contain any hetrodyning vacuum tube oscillators. Ah -of course. corrected. Thanks! The person on the first photo is not Henry Cowell. It is Joseph Schillinger.